Several businesses in Hamble have joined the free tap water refill scheme, which allows anyone to take their reusable bottle into the business to be refilled for free! 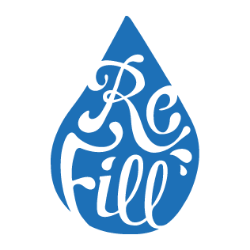 Look out for the Refill logo (above) on stickers in business windows. You can also download the free Refill rewards app to see where you can Refill on the go, or add new Refill places yourself! If your local business would like to join the scheme, please let the Parish Office know so that we can provide you with a sticker. Offices can join too, if there is a publicly accessible tap available! Visit www.refill.org.uk for more information.